This is the first of what I hope will be a series of blog posts to do with my post-grad course in Creative Writing for Therapeutic Purposes, with Metanoia Institute. So I’ll be using this space to explore and expand my notes, which I hope might prove interesting for others. This weekend just gone, we looked at group dynamics and ‘form’. Here I’ll talk about the former – and come back to the latter (there is always a LOT to say about Form…). By choice or by imposition, we’re all a member of a ‘group’. That doesn’t just mean a ‘friendship group’ or a ‘work team’ though; it also means a whole constellation of other groupings. So groups and labels, on either a micro scale or a macro scale, are political. Naming is political. The way in which we’re defined by society at large – immediate, local, national, even international – can have a huge bearing on how we’re treated by others, who we’re supposed to associate with. And this is one of the reasons language holds such power. Thinking about this, I made a list of all the labels that might apply to me and made (oh how I love it) a Wordle. 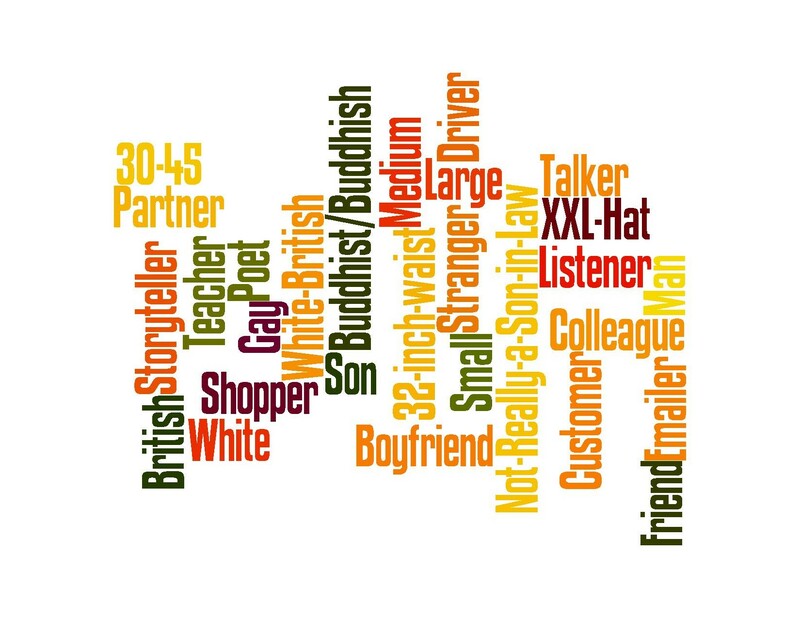 When I started to consider these labels – which all have a bearing on how I’m ‘grouped’ – I realised it zooms right in from ‘British’ through to ‘Essex Boy’ (it’s true, I am one), through to my most intimate relationships with family or partner, and to my body too (ie a ’32-inch waist’ puts me in a different group to a ’42-inch waist’, in terms of clothing and – perhaps – how other people view, label and group me). So when starting out with any group of people working together, it might be worth keeping in mind that before you can develop its own name, its own self-identified label – everyone in it will come with their own ‘scrap-book’ full of imposed labels that will have a huge bearing on how that group functions. People might well find safety in group labels too: if one had just been hiking and saw a ‘Dog-Friendly Pub’, or indeed a ‘Gay-Friendly Pub’, or perhaps even a ‘Gays-with-Dogs-Friendly Pub’ (the ideal scenario), you’d be more likely to go than one that labelled itself ‘Fine Dining’ (which, to me, would speak of economic inaccessibility, snooty looks, and a no to muddy boots). Labels can be an invitation to be included; but which might, inherently, exclude others. Likewise, what we choose to give names to – which groups are considered ‘valid’ enough to have a label even – is extremely important. As a man, I usually only have the option ‘Mr’ on a form. As a woman, you usually have the option of ‘Mrs’, ‘Miss’ or ‘Ms’. Personally, were I female (or identified as such – and there’s a whole other issue to do with gender pronouns for anyone on the Trans- continuum (as we all are, really)), I can see the appeal of ‘Ms’ (or Dr or Professor is you hold one of those esteemed group labels): why is it anyone else’s business what my marital status is, when the form doesn’t even ask men? ← Previous Post Why ‘Could Be The Moon’?